Further instructions for version 2.1-dev. Make sure to run the setup.sql script if you are not installing through the command line. Previous versions should not be in the database if you have to manually run the setup.sql script as it will throw an error when it tries to create the tables. Topic placeholder for version 3.0. I'll update this post when version 3 is released. For now support can be placed here instead of spamming the AdKats thread. We're using AdminCP 2.0.1 (newer version until 2.0.3 didn't work yet and I had no time to try 2.1). I got an issue on my scoreboard: I can't see my playerslist. Chat and everything else is there but no playerlist. This is since a few days and I couldn't fix it. "production.ERROR: exception 'ErrorException' with message 'Undefined offset: 10' in BFAdminBF3/app/bfacp/Libraries/BF3Conn.php:2709"
I can remember that there was kinda bug after the last BF3 server update but I can't remember if it was this line or another. Yes that has been fixed. Just save this file and upload it back to the folder and it should fix the problem. But I wonder why this happened now? I just tried to install the version 2.1 on a clean system (didn't want to update my current adminCP). So I've uploaded all files and edited the .env.php (see picture here: https://abload.de/img/admincpv2.1_env2po16.jpg ). Does anyone got a clue? Last edited by Checka_Wiemi; 28-11-2017 at 11:06. What it looks likes is that the APP_KEY is not being registered on boot which would cause that error. Make sure the file on the server has those changes. Also running this version does make some database changes to the bfacp tables if you were on the latest non-dev version. So make sure you have a backup of the tables just in case. 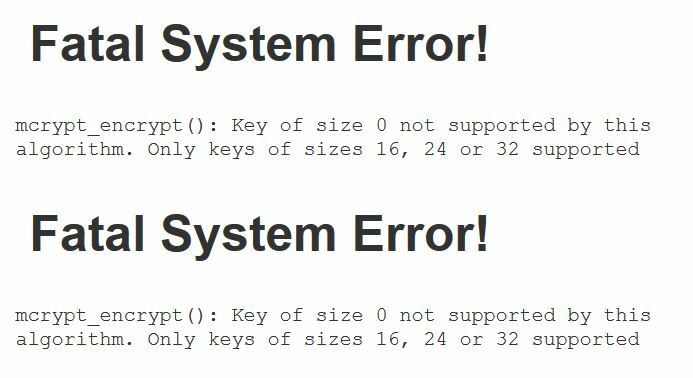 Yeah I also thought about that issue with the key but I've take the key from another db (where version 2.0.1 is running) and this key is also 32 characters long and I just changed some letters in the new one (didn't change the length). I also took a new database to test this version. But as I already said: the key is okay in my oppinion but I don't know why he won't start the side? I've also tried several 16, 24 and 32 characters keys but none worked. Last edited by Checka_Wiemi; 28-11-2017 at 14:18. Which version is the latest:2.0.3 or 2.1? Last edited by keb2; 28-11-2017 at 17:31.